On the first of two Sundays of early in-person voting, Cleveland churches encouraged African-American voters to cast ballots. About 500 people converged at the Cuyahoga County Board of Elections today, the first of two Sundays of early voting in Ohio. WKSU’s M.L. Schultze has more on this year’s “souls to the polls,” the effort to turn out African-American voters, and how it compares to the years when Barack Obama’s name was on the ballot. About 200 people organized by the Greater Cleveland Congregations gathered at Trinity cathedral downtown. The Rev. Jawanza Colvin, pastor of Olivet Institutional Baptist Church, told the crowd this election isn’t about who people vote for, but what they vote for. "We are voting for our children and our children’s children’s children." And as the group prepared to march about 10 blocks to the board of elections -- where they were joined by hundreds more predominantly African-American voters -- Colvin acknowledged issues crucial to the his community – including jobs, education and criminal justice reform – have been largely missing from this presidential campaign. Early voting hours this week are from 8-7 weekdays, 8-4 next Saturday and 1-5 next Sunday. He also acknowledged African-American voters may be less energized without President Obama on the ballot. Outside the board of elections, vans with bullhorns circled the building broadcasting get-out-the-vote messages – competing with the gospel choir across the street. Local candidates passed out flyers. And a campaign bus featuring images of Hillary Clinton and Obama announced America can do better than Donald Trump. 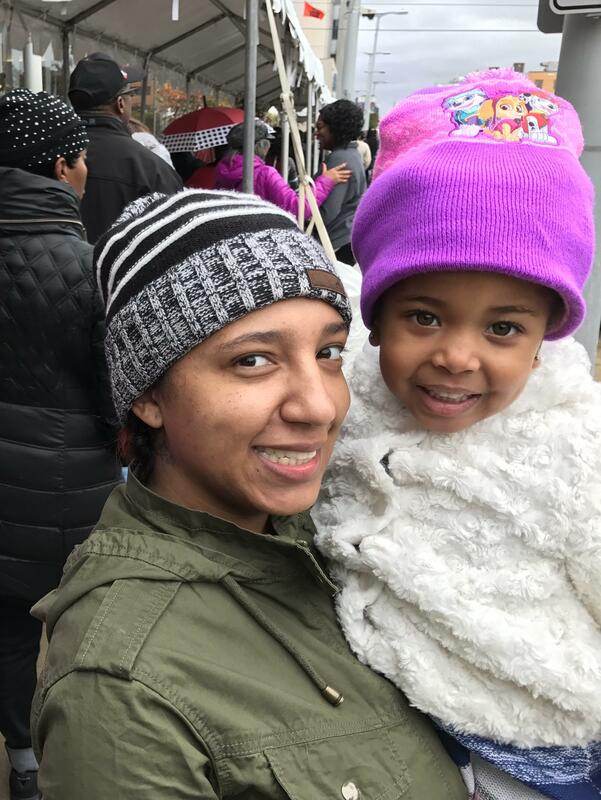 “My daughter got me here," said Samera Hollimon, carrying her 3-year-old daughter Mianna Thomas. "I want her to be able to live in this world and not be judged by the color of her skin … to have equal opportunities as everybody else." She says she had no question in 2008 and 2012 who the better candidate was: Barack Obama. This year, she’s more skeptical. So she asks her daughter. “Who you voting for?" she asks. "Why are you voting for Hillary." The girl smiles: "Because I like her." So far, Ohio has seen less early voting than four years ago, before Republican state lawmakers eliminated the week when people could register and vote at the same time. Ohio remains a huge unknown in the presidential race and neither Donald Trump nor Hillary Clinton is taking it for granted. But it’s far from the only issue on the ballot. This week WKSU’s M.L. Schultze and WCPN’s Nick Castele talk about attempts to read what’s happening with early voting and down-ballot races in the Buckeye State. This story is part of WKSU and Ideastream’s election collaborative. The chairs of Ohio’s two major political parties are carefully watching the numbers of people who are casting early ballots in person and by mail. Democratic Party chair David Pepper says more people likely to vote Democratic have been voting in person or returning their absentee ballots, and he expects the first of two weekends of early in-person voting coming up to be good. “It seems like it’s pretty steady from ‘12, and ‘12 was a winning year for us. So if we simply repeat ’12, we feel good about it,” Pepper said. A new poll of Ohio voters reveals a lot of things about their attitudes toward the presidential candidates. A lot of the same sentiments were reflected among the voters who were among the first to show up for early voting this morning. The Baldwin Wallace poll included the horse-race question: Hillary Clinton up by 9 points over Donald Trump if the election were held today. And for some, it was: early voting began at 8 a.m.